The "Nature Island" spins its magical web through every fiber of this beachfront sanctuary, where guests find peace and solitude and where sea turtles return each year to nest on the protected black-sand beach. A half hour massage per person with a refreshing healthy drink at the end of your massage. 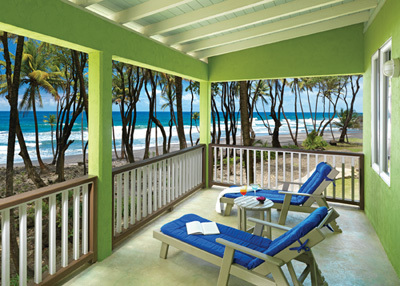 The serendipitous discovery of an exquisite stretch of lush, unspoiled beachfront on Dominica led to the careful crafting of what is now the boutique eco-resort of Rosalie Bay. Tender loving care went into shaping each of its 28 spacious rooms and suites, its organic cuisine, and the resort's nature-inspired, riverfront spa, where elements like detoxifying volcanic mud and smooth river stones are drawn from the island itself. In fact, everything here has a touch of Dominica's spirit; furnishings are fashioned by local craftsmen, colorful artwork reflects the island's African roots, and fresh produce and catch-of-the-day (perfectly prepared, by the way) are gifts from the land and sea. At Rosalie Bay, nothing comes between you and nature unless you want it to. Fall asleep to the sound of the gently flowing river, or seek total quiet in air-conditioned comfort. Relax by the freeform, river-rock-edged pool, or take an invigorating hike up to the mountains in search of refreshing waterfalls and natural pools to splash in. Enjoy a complimentary yoga class in the gazebo overlooking the Rosalie River, and take in the views of the ocean beyond. Pure magic! At day's end, you'll be thoroughly relaxed after a day of hiking, touring, and enjoying the natural setting of Dominica. Take a deep breath and enjoy a delicious homemade dinner at the resort's Zamaan restaurant.